What is SEO? SEO or Search Engine Optimisation helps search engines identify your website and its content which in turn helps the search engine recommend your website for relevant searches. What do search engines look for in my website? Having the right content on each page of the website is essential, along with optimising the content on the pages with correct formatting and including the words or phrases that people will search for. The correct meta data that also contains some the the words or phrases used in the page text, and ensuring its accessibility to all users on all devices is also looked at. Meta Data – Metadata is snippets of text that describe a page’s content. The Metadata is hidden within the code of a page, and doesn’t appear on the website to a user, but is detected by a search engine. Page Title – This is the text you see at the top of your browser window or tab. Search engines use this text as the title of your page which is very important at giving the search engine, and the user, a quick bit of information on what your page is about. Meta Description – A brief description of the page. This needs to contain key information about the content of the page including some of the text (words or phrases that you want to be found with. ALT Tags – An alt tag is a text description for an on your page. This has been adapted by search engines to allow them to identify the image and recommend it in its search results. It also assists people who are visually impaired, who use screen readers, The reader will use the ‘alt’ tag to describe the image. Having the above done to each page of your website is a great start to climbing the search engine ladder and getting the position you need. Our Search Engine Optimisation packages are tailored to your needs and include the essentials above. Off-Site SEO and how important is it? Off-site SEO helps drive traffic to your site by using external sites and services such as social media and advertising. We recommend all sites to make the most of social media, even if they don’t use it personally, it can be essential for a business. The ability to communicate one on one with a potential client, provide excellent customer service or even advertise to a mass audience can all be done by spending a few minutes each day on social media such as Facebook, Twitter or both. By setting up a business page for your business, we are able to provide you the key to communicating with your target audience. Almost every business wants their business to be found on the first page of the major search engines. Your business has to earn that right to get these results using an effective SEO process. Our Search Engine Optimisation (SEO) services are designed to increase the visibility of your website within the natural (or free) search engine rankings to deliver quality, targeted traffic to your website. At Direct Submit, we believe every company is unique and we deliver a specific range of SEO services designed to help ensure the optimum performance of your website. These days, another consideration is environmental friendliness. If you’re a homeowner, it’s simply no good to underpay for an average-quality shower head and then be faced with exorbitant water bills each month – especially if you have a family or other people living in the home besides yourself. 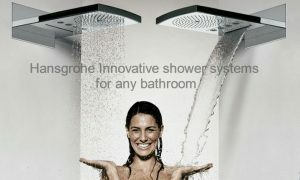 On the upside, the cost of producing higher-quality, environmentally friendly shower fixtures has come down in recent years, and with “green” products now being more sought-after than ever, they are very likely to fall within the price range of someone seeking to renovate bathrooms of any size and for any number of people. If eco-friendliness and cost savings through increased efficiency are concerns for you, then consider installing a shower head from the product ranges of Fiora showers or Hansgrohe showers. Bathroom upgrades can be complicated, particularly when undertaking them for the first time for a small bathroom or in an older home, but they needn’t be. With a clear vision of what you want out of the space, you can easily turn a bathroom of any size into one of the most attractive rooms in your house. P.T. Ranson has been providing branded bathroom supplies and service for bathroom remodelling projects for years. P.T. Ranson has more than 30 years of collective experience and a commitment to providing the best possible products and service for each individual bathroom remodelling project. When buying online from P.T. Ranson, deliveries on the UK mainland are free of charge. For more information, call today on 0191 4696999 or visit the PT Ranson Website today. 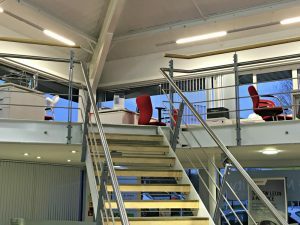 If your business has begun to grow and requires more space, but you want to avoid the expense and inconvenience of relocating, making use of the full potential of the space available within your current premises and creating a mezzanine floor within your existing building to create the space that you require could be the perfect solution. Using the height of your building to make more space with the construction of a mezzanine floor is the ideal way to quickly create the space you need without having the expense and time of managing a major building project such as an extension or making plans to secure new premises, and with the right guidance you will be surprised and quickly and easily you will be able to create a pleasant and functional working environment no matter what purpose you may intend to use it for. At Commercial and Industrial Interiors they are able to offer a wide range of office refurbishment services and have all the expertise and knowledge required helping you create a new mezzanine floor within your building that is completely suited to your company’s requirements. Whatever your reason for needing new space at CI interiors they will be able to manage the whole project for you, right from the initial designs to the final finishing touches such as lighting and installation of the cables and any technical equipment that you may require. Whether you want to create extra storage, new office space or even a staff rest area at CI Interiors they will be happy to come and take a look at your existing building and discuss the various options available to you, when you have settled on a design that you are completely happy with they will ensure all the work is carried out with the minimum of disruption to the rest of your business. So if you need extra workspace for your business why not consider getting in touch with CI Interiors, the real experts in mezzanine flooring and see what they can do to help you? With an excellent range of available options in all areas of office refurbishment services you can be certain that they will be able to help you find a sensible solution to any space issues you may have within your workplace. Commercial & Industrial Interiors are a North East company, who are specialists in the field of internal office building and construction, demountable office partitioning, materials handling and storage systems. If you would like more information then please call 01661 836 304 or visit the CI Interiors website today. Adding conservatory roof blinds to your conservatory is the ideal way to really make the most of the space you have, as not only will they make your conservatory more attractive they will also help to control the temperature and make it a more pleasant environment to spend time regardless of what the whether is like outside but sometimes it can be hard to find well fitted conservatory blinds that suit your tastes and your budget. At Conservatory Blinds Direct they have an excellent assortment of made to measure conservatory roof blinds available to suit most tastes or design schemes and with plenty of helpful advice and information available as well whether you are looking for inspiration or know exactly what you want you may be able to achieve the design ideas you are aiming for far more easily than you may first think. With a wide choice of designs and colours on offer no matter what size or shape your conservatory may be you will be able to find conservatory blinds that complement the rest of your home perfectly, whether you want to create a functional utility area, a fun room for the kids, a dining room or simply a place that you can sit and relax in peace. Having well fitted conservatory blinds it the perfect way to turn your conservatory into a real feature within your home and gives you the opportunity to create a peaceful and attractive space to relax in, and with the added privacy and security conservatory roof blinds can offer they are a really worthwhile investment if you want to really make the best of what your home has to offer. 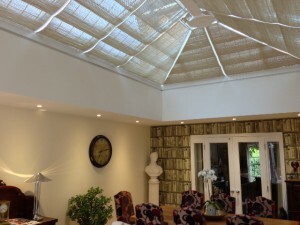 So if you want to give your conservatory a real lift why not take a look at some of beautiful designs of conservatory roof blinds available at Conservatory Blinds Direct. With a reliable and professional made to measure service and a full installation service available as well you will be able to have a conservatory you love with the minimum of fuss and disruption to your household. You will be surprised how easy it can be to create the conservatory you want, with the expert service, competitive rates and high quality blinds they have on offer. The Conservatory Blinds Direct and Shutters Company has been manufacturing bespoke blinds for homes across the UK for over 30 years. Our price match offer, lifetime guarantee, local production, green manufacturing practices, price match offer and lifetime guarantee ensure that you will have the best possible customer experience and, once the installation is complete, you will fall in love with your conservatory all over again. For more information or to book your free appointment, call us today on 01642 762497 or visit the conservatory roof blinds website today.